Students and staff at Jordan High School recently showcased the first three classroom buildings to be completed as part of a $208 million renovation of the 27-acre campus in North Long Beach. The community open house on March 14 was the first opportunity for the public to tour Building 1100 and Building 1200, which were opened in January, and Building 1300, which will open next month. The three buildings include computer labs, art studios, music rooms and a state-of-the-art manufacturing lab for three academies: Excellence Through the Arts; Media and Communications; and Advanced Manufacturing, Construction and Engineering. Also opened in January were new north and south parking lots and a new cafeteria and covered lunch area. New clocks, intercom speakers, fire alarms, security cameras and audio-visual systems also were part of the first phase. The Jordan campus was originally built in the 1930s, with additions and renovations occurring from the 1950s through the 1990s. 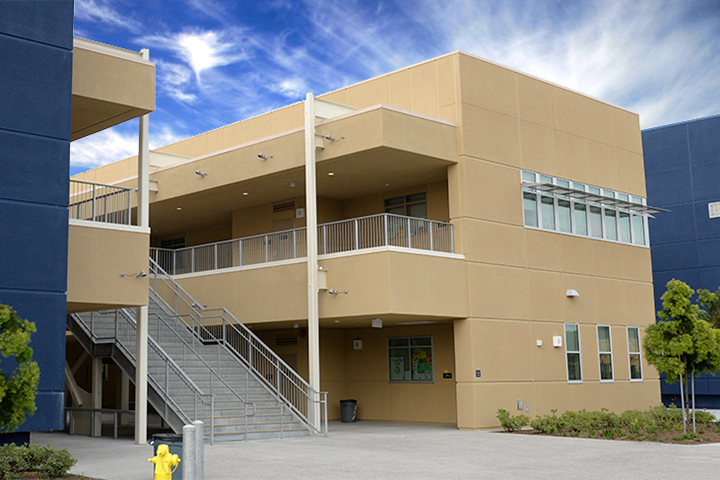 The current renovation project is the largest and most ambitious funded by Measure K, a school bond initiative that was approved by voters in 2008. Renovations happen while students remain on campus in 29 portable classrooms. As each part of campus is renovated, displaced students move into the portable classrooms, and then return to their new buildings upon completion. The next phase of renovations has already started, with demolition of two more buildings and the beginning of construction of Building 1400 and Building 1500. When completed in two years, these buildings will house the Architecture, Construction and Engineering Academy and the Academy of Hospitality and Tourism. Modernization also is scheduled for the current band building and auditorium. Future phases include the renovation of the administration building, career center, library, gym, science building, the addition of two more classroom buildings, an outdoor swimming pool and new stadium and athletic fields. Nearly 400,000 square feet are being renovated or added, including 132 classrooms for seven academies. The campus will serve up to 3,600 students.